Czech Beer - Do You Like Pilsners? We're not talking just any beer here... we're talking Czech beer... lager to be specific. It was in the town of Plenz (Pilsen) that the first light golden lager was produced. Pilsner has become a generic term for similar lagers wherever they are brewed. 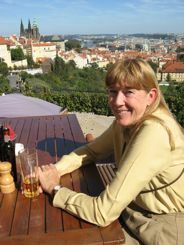 Pilsen is still brewed in its birth town which is about 50 miles (80 km) southwest of the Czech capital of Prague. The Plzensky Prazdroj Brewery's best known brew is Pilsen Urquell. Is Bud American or Czech Beer? 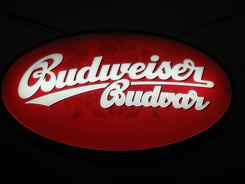 Of interest to drinkers of the American Bud or Budweiser, the original Budweiser Budvar is brewed 100 miles (150 km) south of Prague. The little town's name is Ceske Budejovice... Budweis in German. There have been legal fights between the two beer producers, and as far as we know currently, they can both use the name as long as they don't step on each others toes. You can take day trips or tours to visit these breweries from Prague and sample Czech beer. If you just want to try some beer in the city, the best place is in a pub or beer hall. You'll notice a sign on pubs with a logo for a particular beer. Each pub, beer hall, or sidewalk cafe is supplied by only a single brewery. ...but to taste different brands, you'll have to "bar hop". 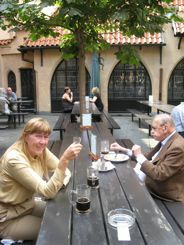 One fun beer hall that we went to was U Fleku in Prague. They have a special strong dark lager that you can only get at the beer hall. This isn't just a touristy place... though there are some tourists here. 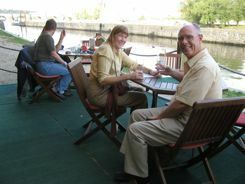 We shared our table with a cute elderly Czech man who seemed pleased that we liked his country and his beer. U Fleku is the smallest brewery in Prague. It's pub has brewed this unique dark beer, called Flekovske, since 1499. Don't worry about remembering the name, just ask the waiter for their special beer. You won't have any trouble communicating, remember, Prague has been discovered by tourists from all over the world. Don't wait to be seated in beer halls and pubs. Look for a free chair, even at an occupied table. Once you've ordered, the custom is for waiters to continue to bring you beers when yours is empty until you tell them to stop. You don't pay for your food and beer as you get it. The waiters will keep a running total, and you'll get the bill when you leave. Have you heard something similar before from other proud beer brewing countries? Whichever brand it is... Czech beer is among the best beer I've ever tasted!